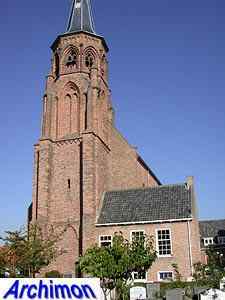 In Dutch this church is usually referred to as Abdijkerk, which means abbey church. 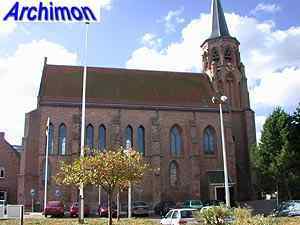 Even though the abbey is no longer there and the church became protestant long ago, the old name is still being used. In ca. 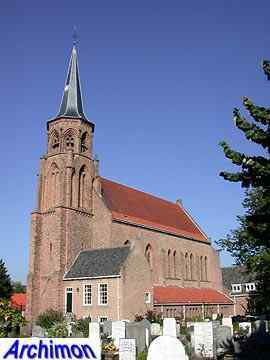 1225 a convent was founded by count Floris IV of Holland and his wife Machteld of Brabant. 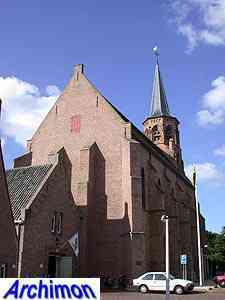 The complex was built by Flemish Cistercian monks, and the church shows some Flemish influences. Especially the tower, which was built in ca. 1300, is purely Flemish. 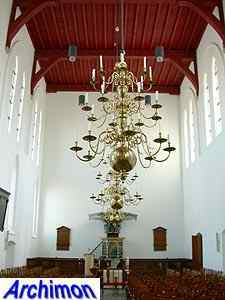 The eastern part of the nave dates from ca. 1250 and has two narrow pointed windows on each side of each of the three traves. 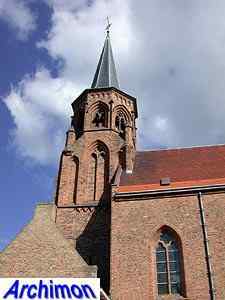 This part is in Schelde Gothic-style, a transitional style between Romanesque and Gothicism. The two western traves are purely Gothic and have one larger window on each side. 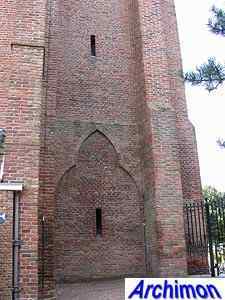 This part appears to have been built in the same period as the tower. 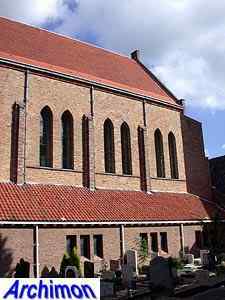 Like often with Cistercian churches the nave of this one seems to have been divided in two storeys, or at least have had a gallery, as there are two horizontal rows of windows. The upper row is especially noteworthy because its windows consist of both inner and outer windows, of which only the inner one was glazed, with a passage in between the two walls that held them. 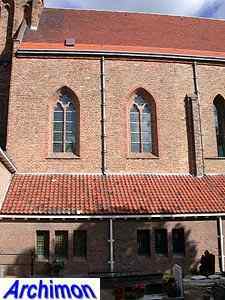 This is similar to the windows of the Cistercian church of Lissewege, Flanders, the abbot of which was in charge of the construction of the abbey of Loosduinen. In 1573 the war forced the inhabitants of the abbey to leave, never to return. The abbey complex was later demolished. 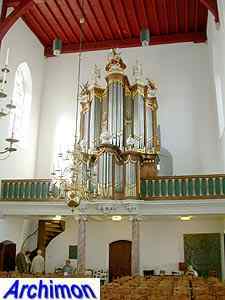 Only the church survided, albeit as a ruin, and after much-needed repairs was used by the protestants. Many changes were made to the building. The choir was demolished, as were two traves of the nave, the windows and entrances were closed and the church was covered under a coat of plaster. 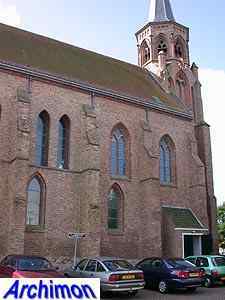 In 1908 a neo-Gothic transept was added. Several restorations have resulted in the current state of the church. In 1941 corner-turrets were added to the upper part of the tower. 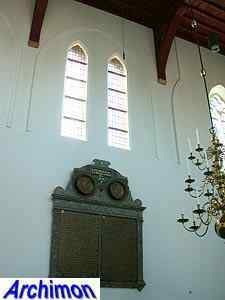 Although these are in Flemish style there is no evidence for their former presence. In 1971 another restoration started. Windows and entrances were reopened, the plaster was removed and the transept was demolished.